Tech blog based on research and development done by the Elementz team. ESP8266 is a wifi module controlled by simple AT commands. 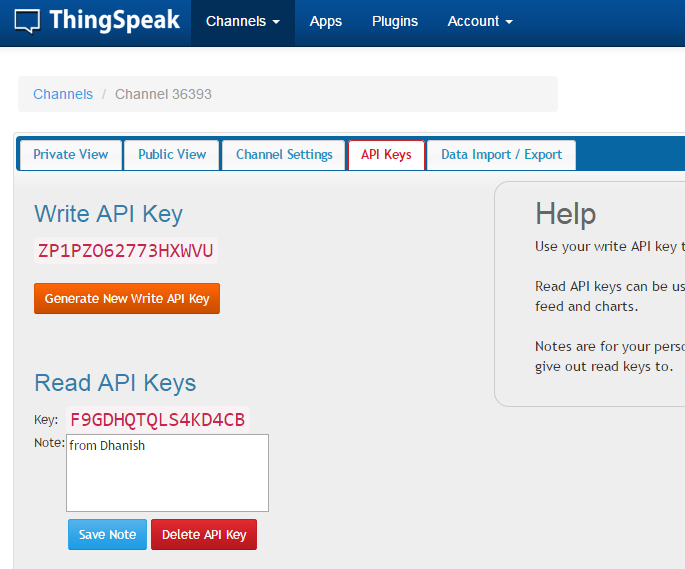 This post describes the usage of a web api developed developed by thingspeak.com to plot data on the web. Connect the ESP8266 module to your Arduino board as following. Please note that Software serial is used to send and receive data to the Wifi module from the Arduino so that any input/output pin can be used for interfacing with the module. Following code is used to upload the temperate sensor data to the thingspeak website. User need to edit the API key value to match the one obtained when you login. It is also assumed that you are connected to a router and the network is accessible. Note: A good idea is to read the IP address of your module using AT+CIFSR command. Also can check the connectivity by pinging the IP obtained from another computer. Use ping and check the response. // read the value from LM35. // read 10 values for averaging. Connect LM35 temperature sensor using the pinout shown below. A0 pin should be connected to the out pin of LM35. 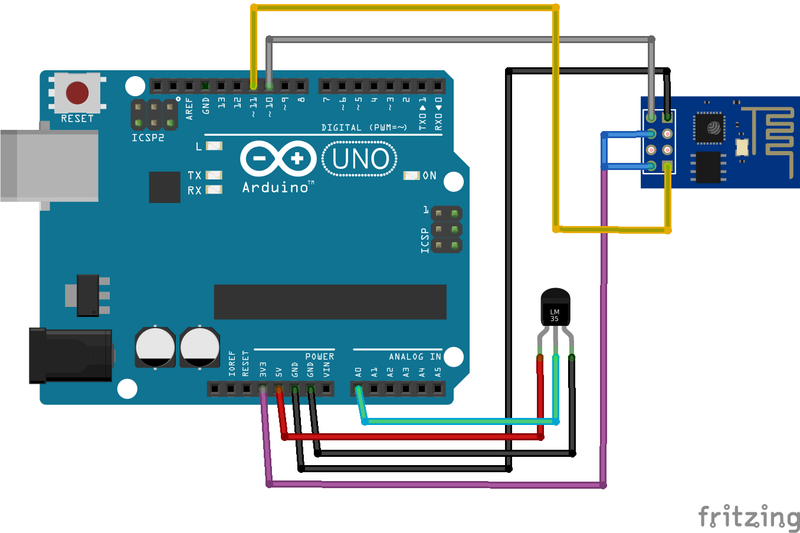 Once the connection is made, connect the programming cable and upload the code to your Arduino board. Open a webbrowser and login into the thingspeak website using the appropriate credentials, Then browse to the public channel to see the graphical representation of the data uploaded. Thingspeak also has several customisation options. You will become familiar with these if you are exploring the settings section in their website. We are looking for ESP8266 remote serial Port WIFI wireless module. We are entering in to home automation and Industrial automation solutions. Quantity will be bulk once we start the regular production of our products. Kindly send me the quote for 50 / 100 / 500 and 5000. Actually, I’m doing the same project where I want to display temperature data in Thingspeak. The circuit connection same as yours but I didn’t get any output both in serial monitor and channel in Thingspeak. The code was successfully uploaded into the MC and both my PC and ESP8266 connected to the same wifi. Can you check what is wrong with mine? can you clarify how you are connecting 3.3V from arduino to esp…I see a loop in esp and another connection from 3.3v to loop…can you elaborate more on how this is done? In most cases ESP8266 will work with 3.3Volt from Arduino board. But if the power is not sufficient you need to use a 3.3Volt regulator. LM1117-3.3 is a good and cheep choice. Any plans on making a tutorial for interfacing a PIC micro-controller with ESP8266? There are lots of microcontroller families available in the market and is not possible to make tutorial for each one. But the basic data format remains the same. Try understanding the given code and you can easily port it to PIC uCs. Hey Elementz online May i know the ESP which is from you will readily available with firmware or we want to port the it by manually ,If in this case what is the firmware.I need to port ESP8266 V0.9.5.2 firmware and i am having FTDI 232, but i cant able to upload it. can you able to give some ideas to do it. The ESP8266 module we sell works with the given example without any firmware modification. Incase you want to change the firmware the following link can be used as a guide. How are you connecting esp8266 guy to internet in the above code, i mean without using ssid and pass of a network. are you using any other method ? The SSID and Password are mandatory to connect with the network. You can use serial terminal to send the appropriate AT commands to get connected to the network before running the mentioned code in this post. Thanks for the tutorial, I am able to log my data now! Quick question on your network comment (as I am still new to esp8266). Will this work as a standalone and not tethered to the PC? I see what you mean by connecting to the network first via serial monitor, but can ssid/pass be included in the sketch in an event that the wifi router cycles power, and have it auto connect? yes, it has auto connect facility. Why is the GET request missing a “HTTP/1.0” or “HTTP/1.1”? how to set ssid and password for connecting internet ? For complete AT command list. can this code is measure negative temperature? Yes it can be done. Need the circuit to be modified for achieving the measurement of negative temperature. The following link may help you to get started. 2. Why ain’t you using AT+CIPMUX=1 for multiple connections? 3. If AT+CIPMUX needs to be used how can I go about it? On Tools>>Boards>>? which board I have to choose? The example given is for arduino uno. I did the same connection with an external 3.3V power supply for esp-01.I’m getting the values printed on serial monitor,But thingspeak channel is not getting updated. What do you mean by this line ? Can I use more than one sensor in the ciruit ? when I use raw AT commands, I am able to update my thingspeak channel though…so I guess it is a “software” issue ? If someone has a clue, I would be very grateful !